I had found near my sister's house in Paris a small shop selling half price luxury yarns and thus I bought 8 yarns of a fine wool mixed with cashmere and silk. Coming back home I started quickly to use it to knit a shawl. I had no pattern, just seen on a lady wearing it in France. I regretted I did not think of taking a picture... it would have helped me a lot. But I must have photographed it mentally quite well as I believe that the finished result is very similar to the original. Yesterday my daughter with her baby M. came for a visit, just as I was finishing putting the 146 fringes. I thought I could keep this shawl for myself for once, but I am not sure if this will be possible. To understand, you just have to see how she took it and wrapped herself inside together with her baby! 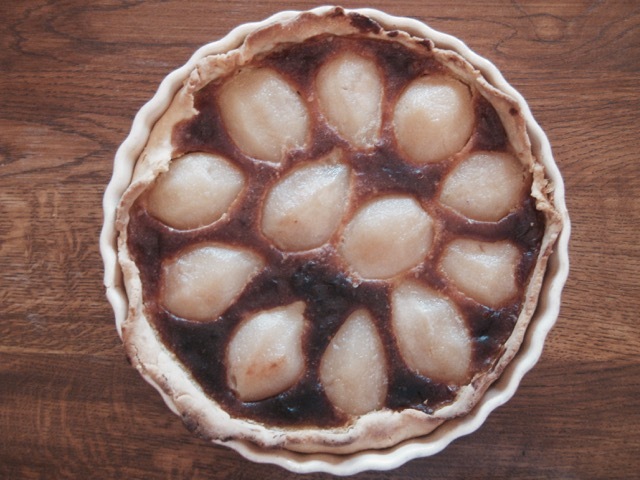 I baked a French Bourdaloue Tart : poached pears on an almond cream. We had it with a cup of tea in the afternoon and I must say it was delicious. In other words, we had a wonderful day! Your daughter and grandson wear your shawl well......you may have to make another one for yourself! Lovely! 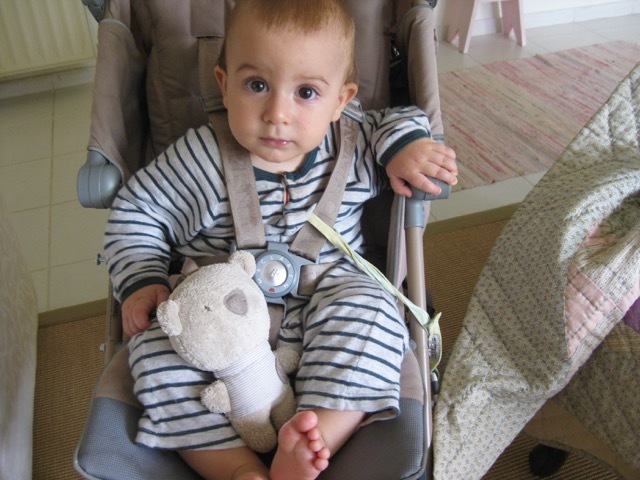 Your grandson is getting so big. They sure look cozy all wrapped up. I can almost smell your delicious tart. Yum. Have a wonderful week. Tricoter n'est pas dans mes loisirs mais parfois je suis tentée ! Peut être un jour......ta petite famille est très mignonne et la tarte avait l'air délicieuse !! Bravo pour ton châle ! 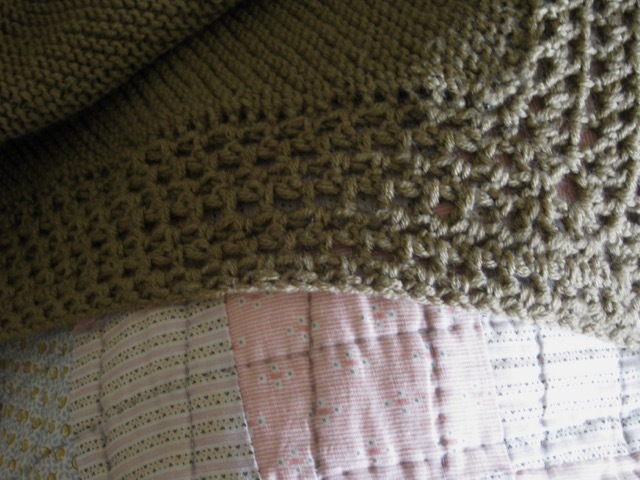 Your shawl is lovely and is perfect for cuddling babies in. 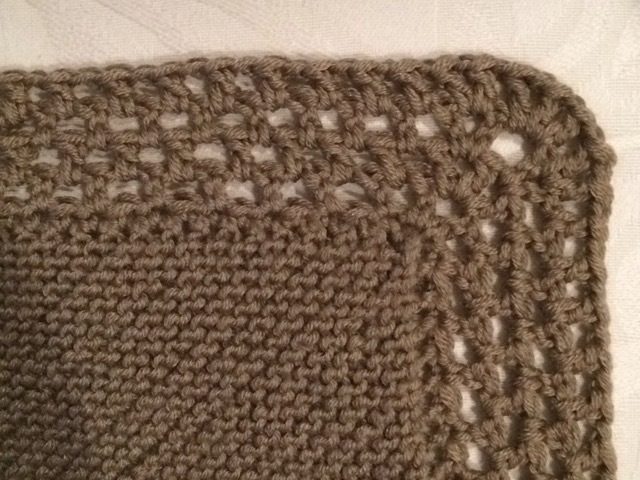 I have been looking at shawls for sometime now but most seem to be advance patterns which is beyond my capabilities. Is this knitted and the edge crotched? I do admire people who can see something and then do it without a pattern. Such talent to make a shawl from one that you had seen. It looks wonderful! Love it all. The shawl, the tart, the tea, the babe. We've enjoyed poached pears here, too. 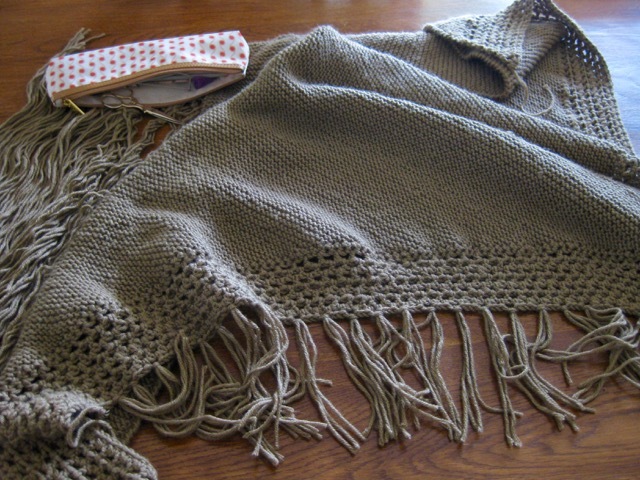 How sweet to have a shawl that was knitted by memory from a sighting of a woman in France. That looks like a warm and cozy shawl- beautiful! Gorgeous! Your daughter and your grand! You made something very beautiful! 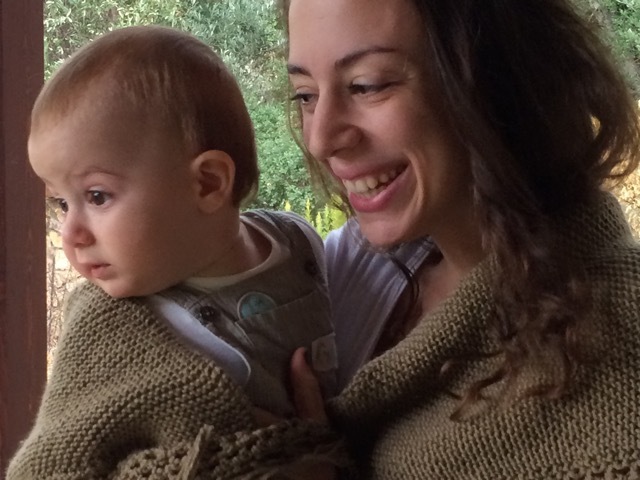 You made a beautiful shawl that looks like it is completely at home on your beautiful daughter and grandchild! The tart looks delicious and now I'm hungry! Your shawl is beautiful! The stitches are so precise and neat. Still, I have to say, your daughter and grandson are even more beautiful. You are a lucky woman! Lovely shawl, and unfortunately your daughter looks fab wrapped up with your grandson!! You are a woman of many talents! The shawl looks lovely and the tart makes my mouth water! Sounds like it was a perfect day with your daughter and grandson. M is getting even more adorable and your daughter is so beautiful! Yes, that shawl would be going home with them. LOL It is very beautiful and the color will go well with so many outfits. You do beautiful work Christine. And beautiful baking too, yum! 146 fringes - oh my! You should keep it - they would look sweet in whatever they wrap themselves in.